Over the years, Penske has partnered with Loberg Construction on more than 30 projects for its corporate-owned facilities in Illinois and Wisconsin ranging from new construction, renovations, office build-outs and new additions to existing facilities. The Penske Chicago Midway project is the company’s largest truck leasing and servicing facility in the country. The 25,000 square-foot ground-up project started in March 2017 and was completed in December 2017. The new facility includes 8,000 square feet of office space, a warehouse with repair garage, wash bay, and fuel island. The location will house a fleet of up to 30 trucks ranging in size from rental vans to 18-wheelers. 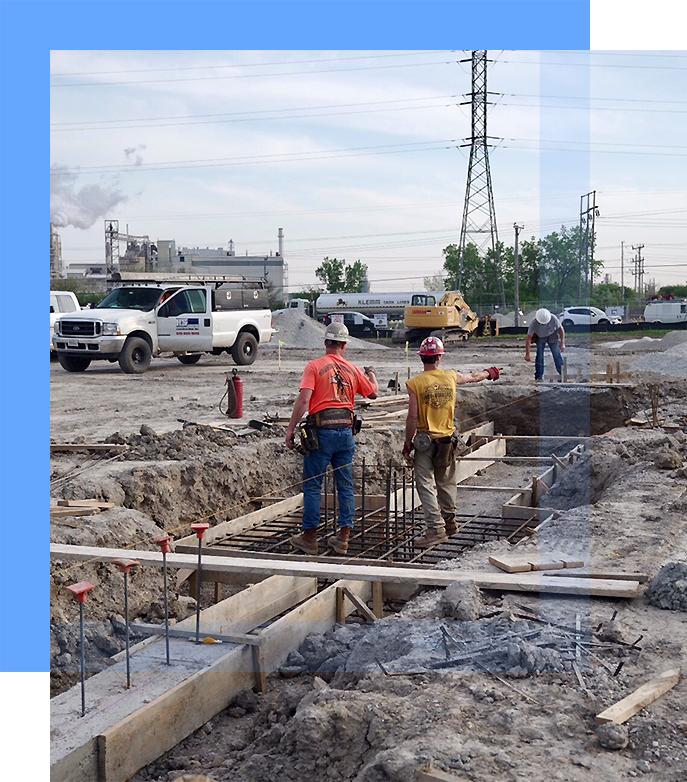 Team Loberg worked closely with the MWRD (Metropolitan Water Reclamation District) and the Illinois EPA (Environmental Protection Agency) to control for any possible pollutants on the construction site. The 9-acre SWPPP plan prevents any storm water contamination, controls sedimentation and erosion, and complies with all requirements by the EPA. Our team is committed to protecting the health and safety of the communities in which we build by upholding the highest standards of construction excellence. The facility was being built on a parcel of land that Penske acquired in Bedford Park, a mostly industrial hub adjacent to Chicago’s Midway International Airport. Extensive poor soil was discovered on site and required us to excavate to a depth of 14 feet, remove all refuse, then add a fill of CA7 stone to serve as the structural subgrade. The over-excavation of foundations/footings also generated additional tonnages of spoils (large chunks of concrete and asphalt along with old auto transmission parts and other artifacts from the parcel’s former incarnation as an industrial debris site) that needed to be accounted for. We presented two options to Penske: Either haul the spoils offsite, at a considerable extra cost to Penske; or keep the spoils onsite and raise the entire site by 12 inches. Both parties agreed on the latter approach–raising the site by a foot would mitigate exposure to any potentially contaminated soils, as well as avoid the excessive costs of hauling the debris away. The industrial project was completed with pre-engineered steel for the warehouse and insulated panels for the wall and roof. There was also 24,000 sq ft of radiant heat incorporated into the slab on grade concrete flooring in the warehouse and wash-bay. The elaborate system of tubes pumps heated water underneath the ground and is set up before pouring concrete. Our construction team has an in-depth understanding of the sequence of construction and how all of these unique project initiatives come together for successful execution.